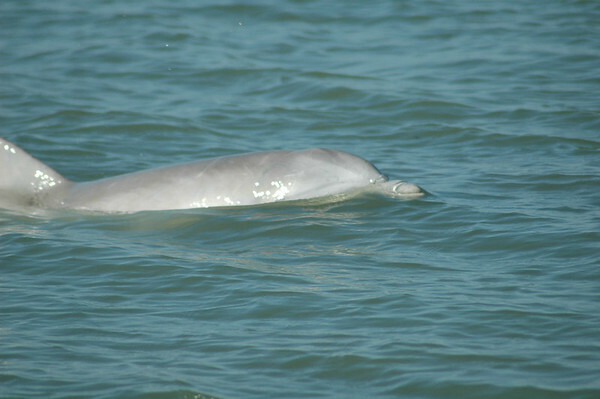 Today, on a day off from our volunteer job at Santa Ana National Wildlife Refuge, we drove over to check out the Laguna Atascosa National Wildlife Refuge and then took a dolphin watching tour from Port Isabel at the causeway leading to South Padre Island. 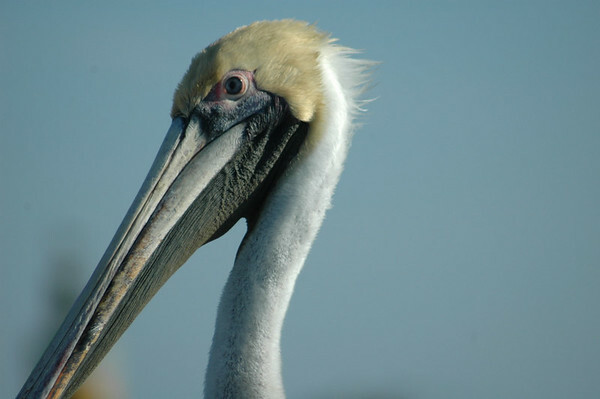 Today, we were making a trip east to the Laguna Atascosa National Wildlife Refuge in southern Texas. 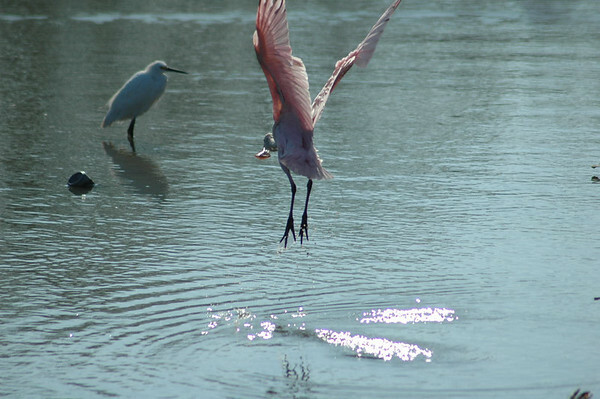 As we were traveling, we stopped at one of the resacas to get a photo of the pink Roseate Spoonbill. As I was taking a shot, it decided to fly over to the egret. 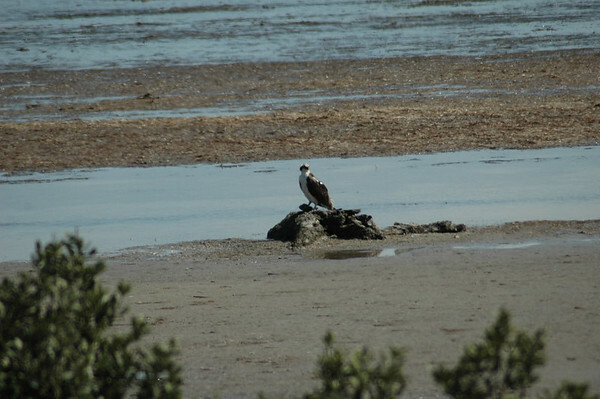 At least this photo shows the color and the unusual bill. 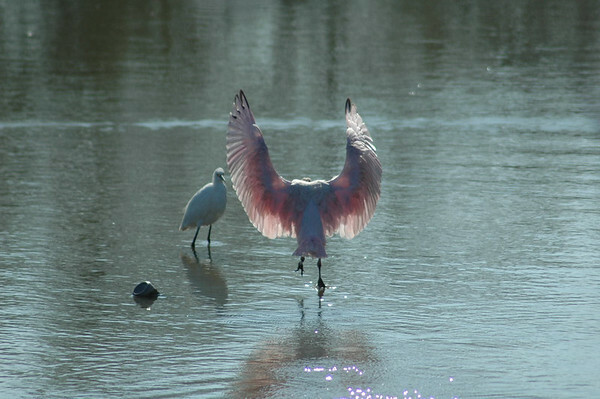 But I had to also include this shot as it looks like a pink angel walking on water. Even the shimmer on the water in the foreground is pink from the sun shining through its wings. Cool. 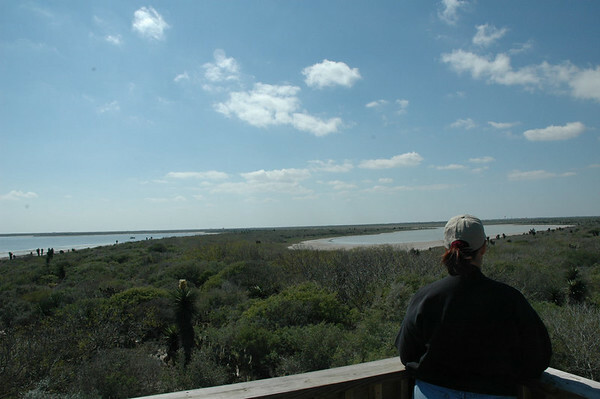 We continued on to the Laguna Atascosa National Wildlife Refuge which is just west of South Padre Island across the Laguna Madre bay. 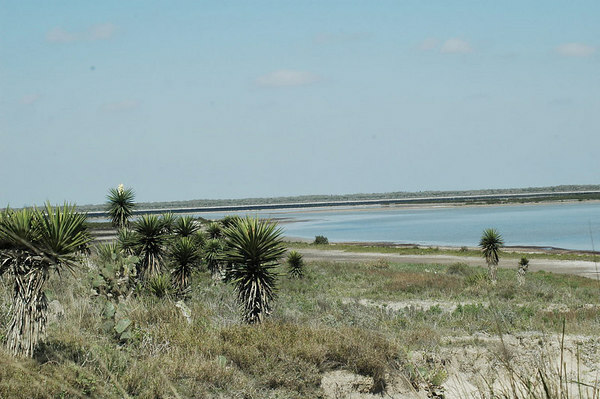 Laguna Atascosa is a sister Refuge to Santa Ana and is part of the South Texas Refuge Complex. However, it is much larger than Santa Ana with two 45,000 acre tracts compared to Santa Ana's 2,088 acres. We are volunteering at Santa Ana until mid-April. Laguna is also home to about half of the Ocelot population left in the U.S. They think they have 20 - 30 cats, though they are nocturnal and are rarely seen on this huge Refuge. We parked at the Visitors Center and were immediately drawn to the feeding station. 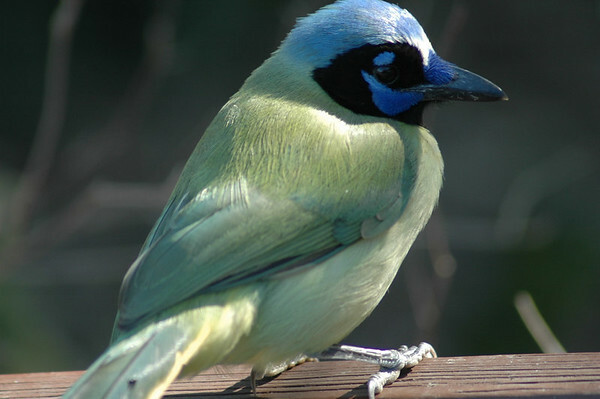 How about a close-up of a Green Jay for starters? Then we were treated to a mother and baby Javelina that wandered into the feeding area. Notice the Green Jays on their backs picking off bugs. 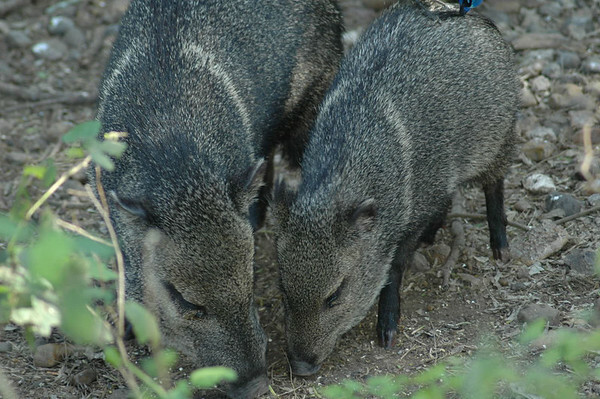 With the little ring around their shoulder area, these animals are also known as the Collared Peccary. 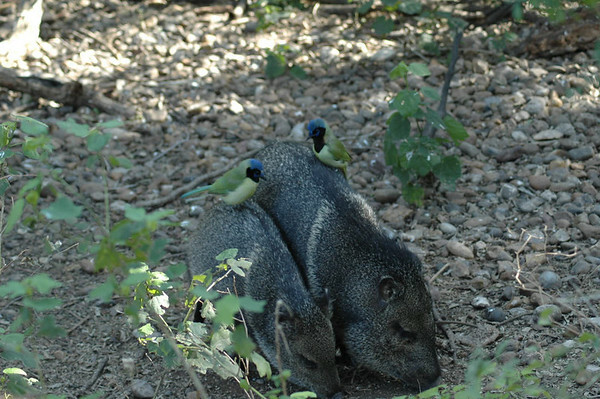 It was fun to watch the little Javelina family up close for a few minutes. 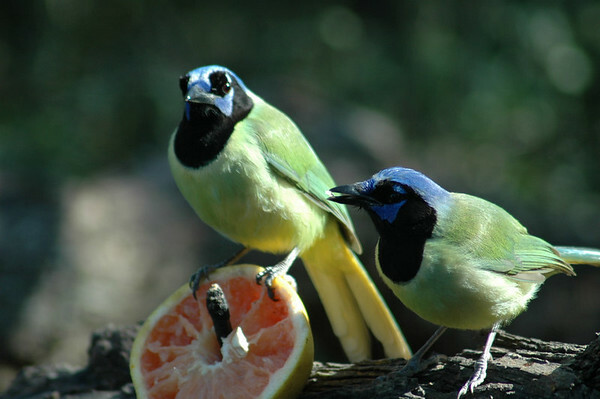 Here are a couple more Green Jays chowing on a grapefruit. 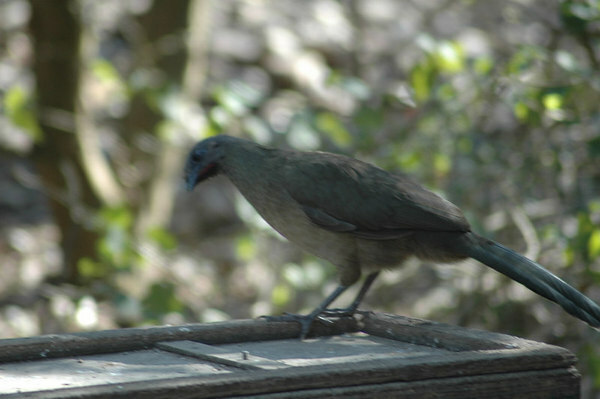 Then some Chachalacas came by for a visit. Slowly, we dragged ourselves away from the feeding station and entered the Visitors Center. There we found a couple of volunteers that gave us the scoop on the Refuge, and where we might see some animals along the fifteen mile driving loop on the east half of the preserved land. We found that they have an evening tour from 5:30 to 8:00, but they were booked up for today. Their tours are small and they fill up quickly. I'm sure we will do that another time. 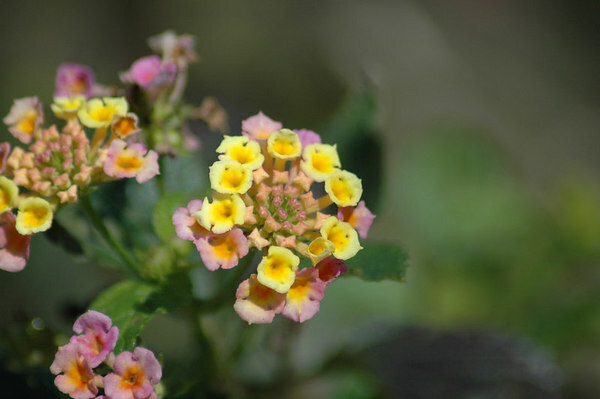 We walked a trail near the Visitors Center finding only this purple and yellow Lantana. Eventually we found a photo blind where they were also feeding birds. 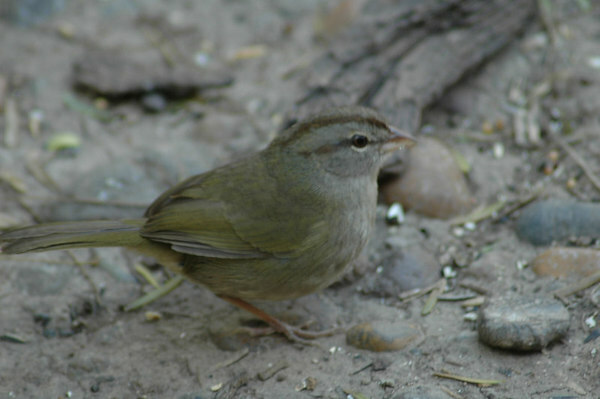 Besides the Green Jays, Cardinals, Great-tailed Grackles, and doves, we got a good luck at this cute little Olive Sparrow. 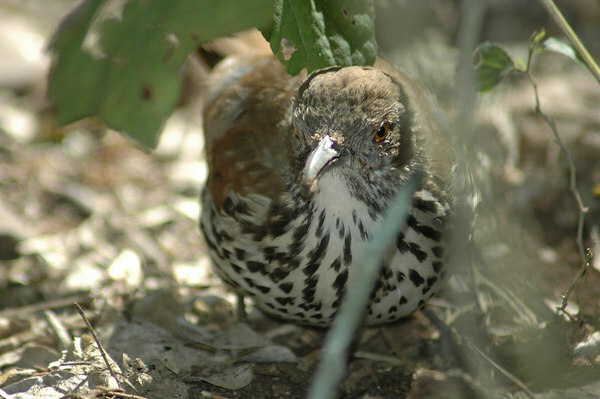 And I was able to get this nice close-up of a Long-billed Thrasher. Finally, we made our way out onto the driving loop. 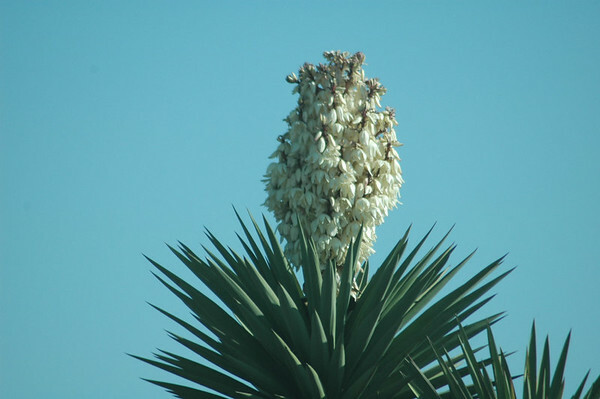 We immediately noticed the beautiful Yucca blooms all around. 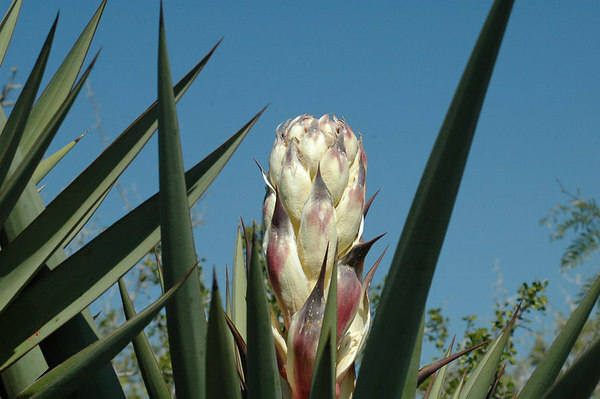 This is what the bloom looks like prior to opening - gorgeous even before it opens. 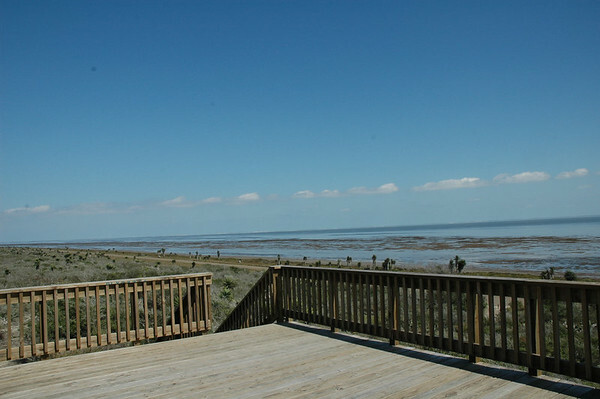 A long section of the loop runs along the Laguna Madre where we saw all kinds of shorebirds in the distance. 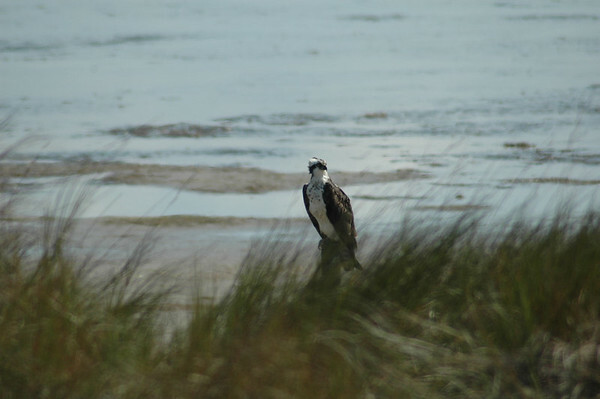 Everywhere we looked along the beaches we saw Ospreys. Each one seemed to have a fish. Along the edge of the pond we spotted three Whitetail Deer. 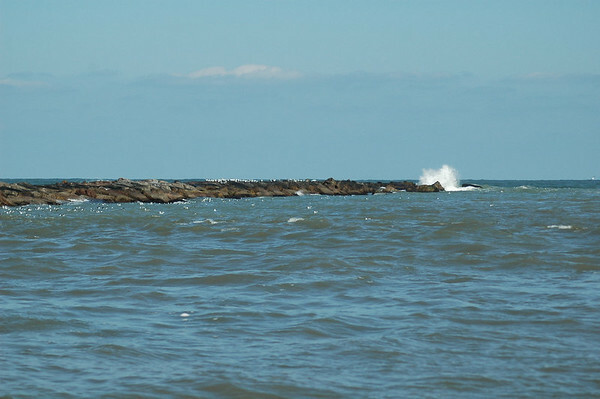 By this time, Linda was getting pretty hungry, so we decided to just finish the loop and head into Port Isabel. 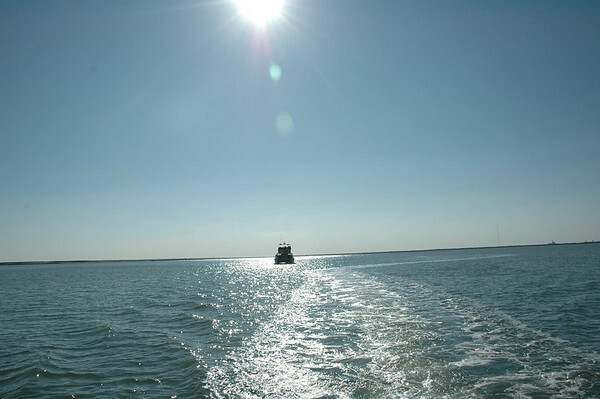 I got the bright idea of checking on a possible dolphin watch boat ride since we were going toward the coast. It was about 1:15, so I called Colley's Fins to Feathers Photo Safaris which I just happened to program into my phone before we left home. They were doing one last tour for the day at 2:00 and they had room for two more. "We'll be there" is what I said, though I wasn't too sure we would make it. We were still a long way from the end of our drive through Laguna Atascosa. As we proceeded, Linda said "I want to see Nilgai". About a minute later, I spotted a family of Nilgai way off in the distance in the brush - much too far away for photos. But we got our binoculars on them and watched the family, including young twins, for a few minutes. Nice! 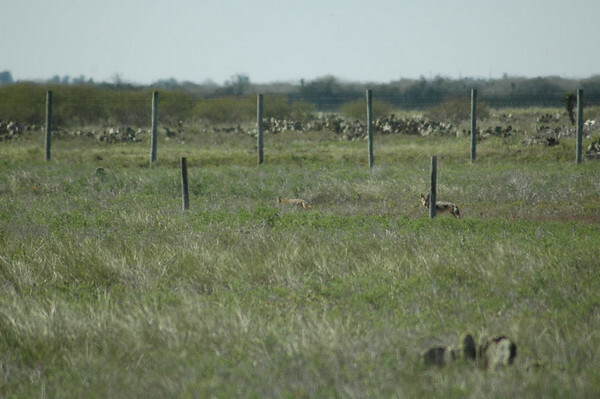 Here is a link to another website that talks about Nilgai and has a couple photos: Nilgai. These large antelope were imported from their native India by the King Ranch here in Texas. Now these exotics roam Texas in greater numbers than currently exist in India. Continuing our drive, I spotted a Coyote in the grasses off to the left. We watched and discovered there were two. They were pretty far off and moving away from us. But I waited them out and one of them finally turned and gave us a look for a photo. 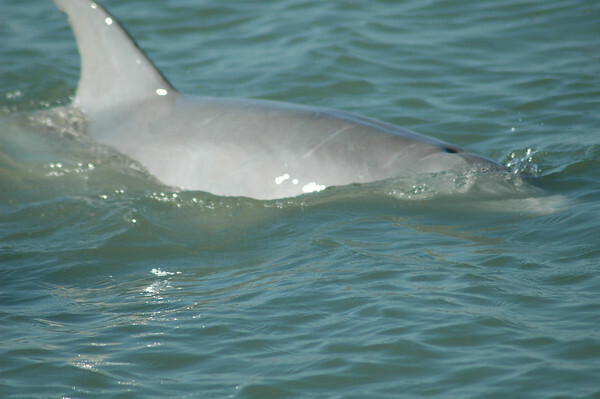 Now I was pretty certain we were not going to make our dolphin trip by the time we got Linda some food. But we headed that way anyway. Finally, I made another phone call just to let them know not to wait for us. It turned out they were going to be about 20 minutes late getting back from the prior tour, so we forged on. We got there in plenty of time and even got Linda a huge cinnamon roll at a harbor cafe. I had chosen Colley's because they were a small operation. From their website, I figured they had a love for the animals and were passionate about sharing. With a small boat and fewer passengers, it should be a more intimate experience. 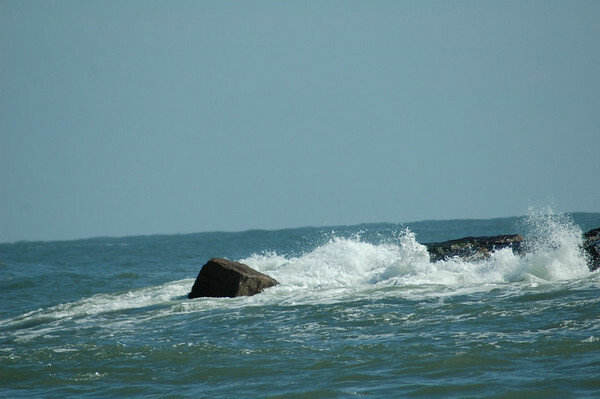 Initially we headed out to the jetty, but we found no dolphins. We did find lots of gulls. 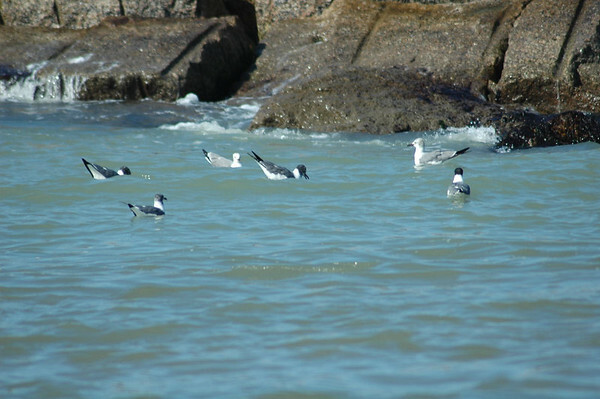 This shot includes three species: the Laughing Gulls (with the black heads), the Herring Gull (the larger gull with the white head) and the Bonaparte's Gull (the smaller gull with the white head). 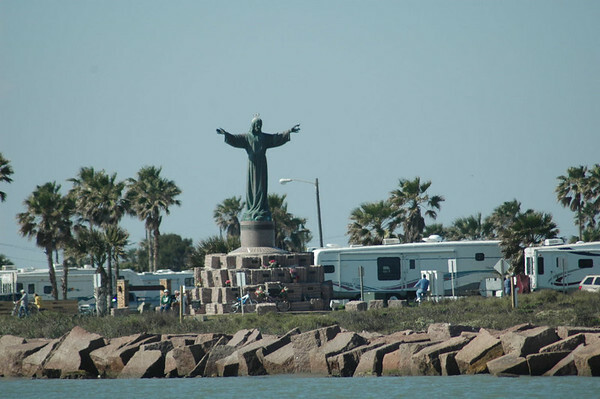 As we headed back toward the bay, I had to get a shot of this statue and the RVs parked in this county park along the southern tip of South Padre Island. The statue seems to be indicating "I caught a fish this big!" to the boats coming back in from the Gulf. 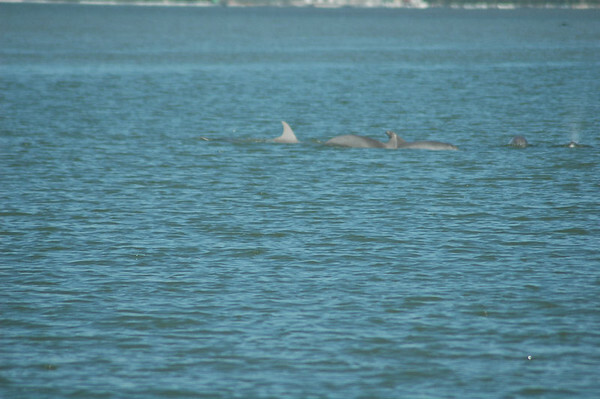 We continued on into the bay and found this group of five dolphins. Yahoo! They came over to say "Hi!" on the first of their many passes. 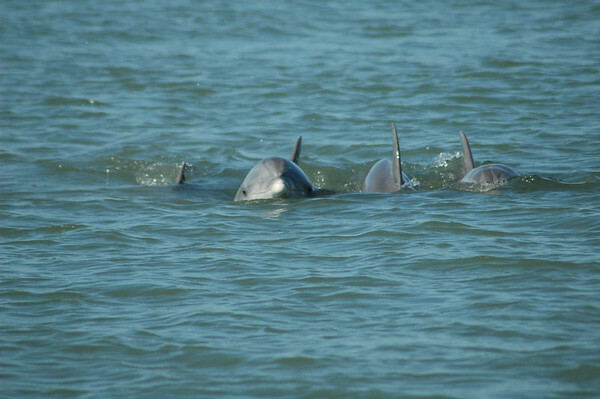 Our captain, Scarlet Colley, recognized two of these dolphins from their dorsal fins. 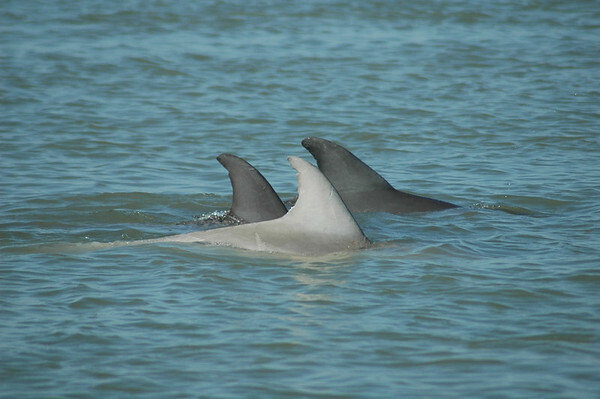 The light colored one is "Angel" and one of the others is "Ponga". These three played with us for quite awhile and I took lots of pictures. 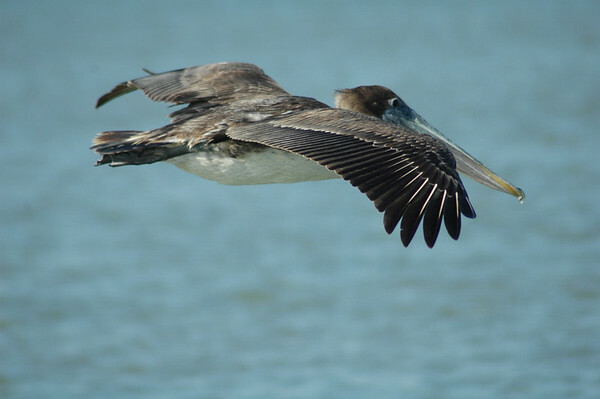 Then this Brown Pelican came flying right by the boat and landed in front of us looking for a handout. 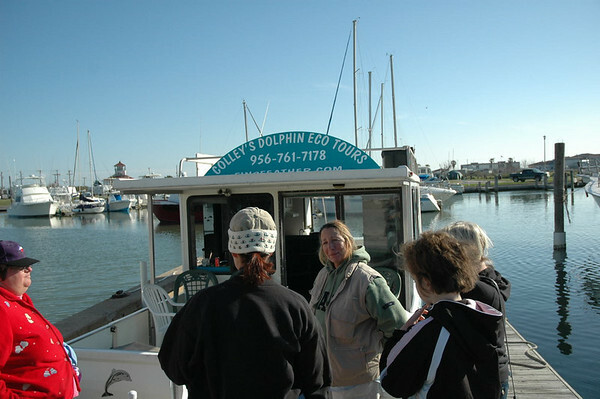 We finally had to leave our friends behind as this large dolphin tour boat came in behind us. 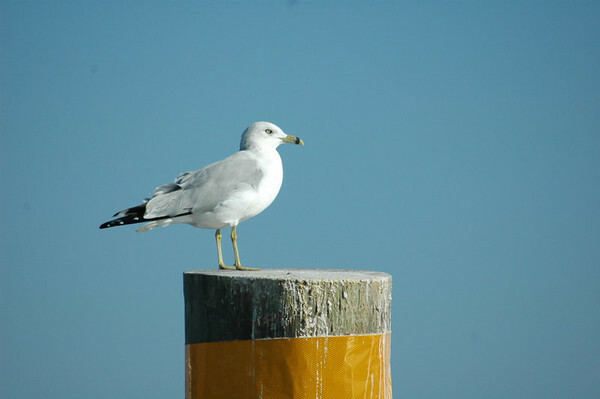 Of course I kept snapping pictures, so here is a Herring Gull against the bright blue sky. 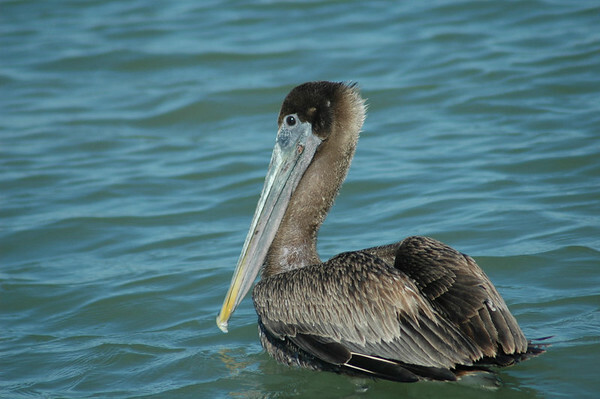 And a REALLY close look at a Brown Pelican. 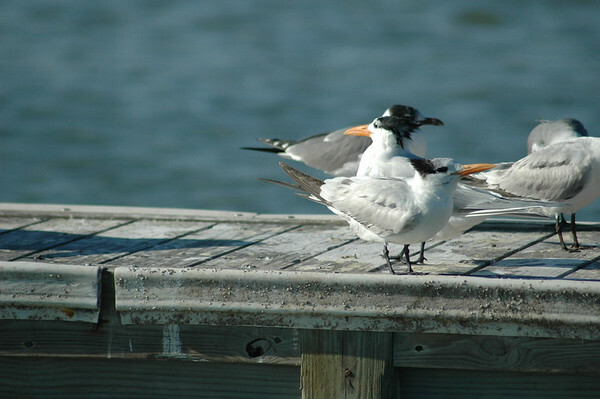 Finally, we have a couple of Royal Terns on the dock among the Laughing Gulls. Our trip was $22.50 per person, but it was well worth it. And I was right about taking the smaller boat with the Colleys. 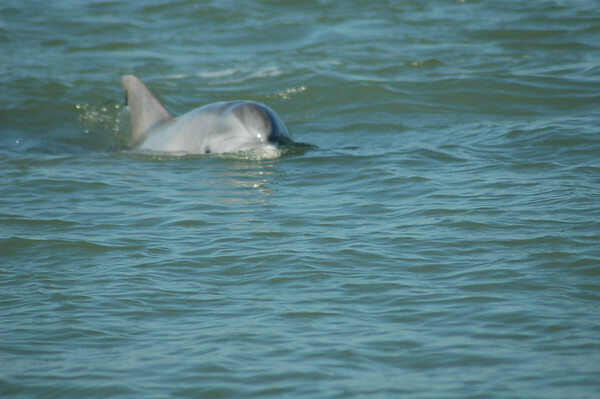 She was so enthusiastic about the dolphins and we played with them - or they played with us - for a long time. 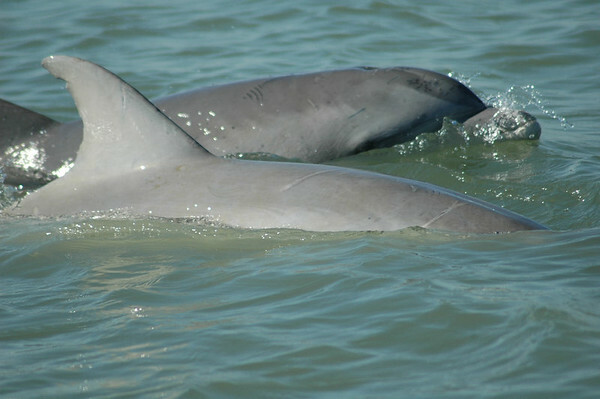 The Colleys are also associated with the Dolphin Research & Sea Life Nature Center on Lighthouse Square in Port Isabel. So on our way home, we stopped there for a look around. 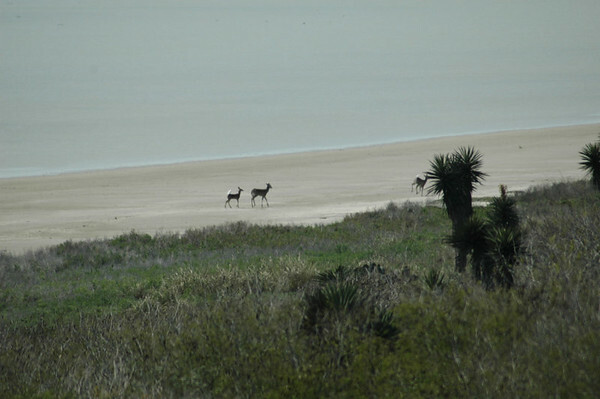 It was a really nice wildlife day in south Texas.